Much has happened in the world of Logic Apps and API Apps since the original announcement back in December of 2014. We have seen the continued development of SaaS connectivity within the product, along with the overall expansion of integration capabilities. We have also seen the team responding to customer feedback actively while maintaining transparency in the process, and even providing a roadmap to give insight into what is coming and when we can expect to see the sweet moment that is GA. Sometimes, customer feedback causes fairly large shifts in the underlying product. Such is the case seen in the latest updates for the product in the form of a completely overhauled designer, new feature support for triggering flows (i.e., any action can be a trigger), and an API deployment model that is more consistent with the rest of App Service and does not require a dedicated gateway. 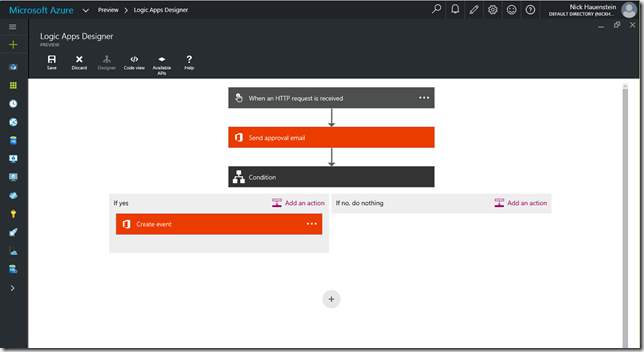 One of the most obvious changes that will stick out immediately as you go out to create a Logic App is the new designer that moved over into App Service from Power Apps. The new designer supports editing workflows build using the updated workflow language (schema version: 2015-08-01-preview), and sports a vertical layout, rather than a horizontal layout, and conditions that appear to wrap around actions instead of being embedded inside actions (though the code view demonstrates that the underlying behavior is similar). You might also notice that the experience of adding actions is much quicker, as this act no longer provisions a new instance of an API App within your own subscription. 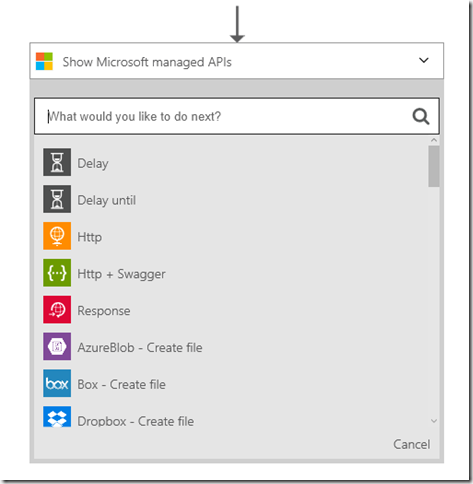 Instead in an interesting reversal, Microsoft hosts managed instances of out-of-the-box API Apps. The result is that configuration information is sent as part of the request, instead of stored inside the API App container, and you will have far more simplified ARM deployment templates given that your deployment will no longer need to take into account each API App used by your Logic Apps. So how do my own custom API Apps end up in the list? Well, you can apply to have them registered in the Azure Marketplace, or you can use the Http + Swagger action in order to point to a custom API App that already exists. Of course that brings us to the question of what it looks like to actually build a custom API App in this refresh of the preview. In the preview refresh, the process to develop and consume a custom API using the designer is quite a bit different. 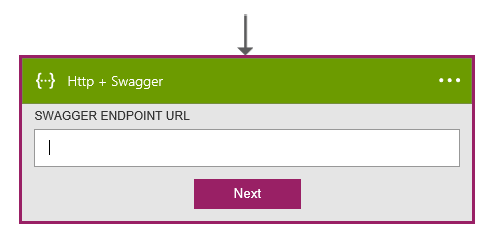 You still have the ability to use swagger extensions for a clean designer experience – but there are new extensions intended to take advantage of new designer capabilities. These capabilities include things like dynamic schemas for parameters / return types of API (imagine a different object shape depending on the type of entity within a CRM system, or a table within a database), and dynamic values for enumerations. The biggest change here though is that we no longer have a gateway managing authentication, internal storage, or configuration for our APIs, and get to manage that ourselves, but as a side effect, we’re no longer constrained by where our APIs live – all APIs get the same first class experience. I would definitely recommend taking some time to read each link within this article before starting out on building a new API. I’m working on building out updates to T-Rex to help with the metadata – while also providing a few example APIs to take advantage of all of the new capabilities – but if you want a head start, the knowledge is out there! What other changes are under the hood that you should know about? Well, you may have noticed the announcement of the availability of Webhooks for Logic apps for one, or even saw the x-ms-trigger extension called out in the article linked above. The end result of this is that any action within a Logic App can have a polling trigger style behavior, or even an async push style behavior, and the Logic App itself can be triggered manually at an endpoint that isn’t tied to a specific Azure subscription. We can see some of these changes in action as we look at actions like the Send approval email action from the Office 365 connector/API. The action sends an email, and then notifies the Logic App what the response is when the response is available – without polling. It even includes the shape of the notification as part of the swagger metadata that is exposed, so that the designer can support using the shape of that async output in later steps. The result is that as a developer, I can use the action to build what looks like a synchronous flow without the complexity of an async flow, and yet I’m benefitting from the performance characteristics of the async implementation (i.e., immediate notification when the event happens rather than polling at a fixed or variable interval). Reading about all of this might have you wondering what QuickLearn Training is doing about all of this, and/or what you should do about all of this. Well, I (Nick Hauenstein) am hard at work on an update to QuickLearn’s T-Rex metadata library that takes into account the new way to build API Apps. I’m on target to wrap up the core code by end of week, and hopefully have some decent sample apps out there shortly thereafter. We’re all busy learning everything we can about the new functionality so that we can rapidly integrate those changes into our Cloud-Based Integration Using Azure App Service course. In the meantime, keep an eye out for announcements from the BizTalk 360 folks about Integrate 2016 Europe. You might be able to meet up with myself (Nick Hauenstein), Rob Callaway, or John Callaway to talk about BizTalk Server, or any of the things in this post. Also watch for the next release of TRex on NuGet which will include support for all of the new goodies we have available in Logic Apps. In the meantime, take care, and have fun building great things!